Older Malaria Drug Regains Effectiveness Chloroquine cured malaria quickly and safely, at only pennies per treatment. But parasites became resistant. A new study shows that if chloroquine is taken out of use, parasites lose their resistance. — Malaria is estimated to cost Africa more than $12 billion a year in productivity. — 300 million acute cases of malaria each year globally. — More than 1 million deaths each year globally. — 90 percent of these deaths occur in Africa, mostly in young children and mostly in sub-Saharan Africa. — Malaria is the leading cause of mortality in African children under five. — The most deadly type of Malaria parasite, Plasmodium falciparum, is most common in Africa. — Resistance to chloroquine, the cheapest and most widely used antimalarial drug, is common throughout Africa. — Resistance to sulfadoxine-pyrimethamine (SP), often seen as the first and least expensive alternative to chloroquine, is also increasing in east and southern Africa. — Insecticide-treated nets around sleeping areas may reduce malarial deaths in young children by an average of 20 percent. But the nets are expensive for the families most at-risk of malaria, who are among the poorest in the world. — The World Health Organization recently backed a new, limited policy to spray DDT inside homes . Malaria kills 1 million children each year. Drugs can cure the disease, but the parasite that causes malaria often develops resistance to the drugs. Now scientists have shown for the first time that drug resistance in malaria isn't permanent. 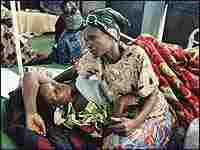 That gives hope that a cheap and safe malaria drug, cholorquine, can be reinstated, making malaria less of a killer. Chloroquine is one of the most important drugs of the last century. It cured malaria quickly and safely, at only pennies per treatment. In the 1950s and '60s, it was the mainstay of a global campaign to eradicate malaria. Then the malaria parasite mutated, learning how to escape from chloroquine. By the early 1990s, the drug failed to cure as many as 80 percent of patients. Dr. Peter Kazembe is a malaria expert in the tiny, impoverished African nation of Malawi. In the early 1990s, most Malawian children with malaria were dying, despite treatment. "For us it was quite clear," Kazembe says. "If you have a drug that is effective in only 20 percent of the cases, then the whole program is doomed to failure." Malawi decided to take a controversial step. In 1993, it banned all chloroquine use. "It was a brave decision in many ways. Some of the well-known experts in malaria control were predicting doom," Kazembe says. Public health experts worried that resistance would quickly develop to the second-line malaria drugs. And then no one would have an effective treatment. Fast-forward eight years. Christopher Plowe of the University of Maryland and his colleagues wanted to know the impact of Malawi's experiment. Without constant exposure to chloroquine, would the parasite's resistance fade away? "We looked for the genetic mutation that causes resistance, saw that it had gone from a rate of 85 percent in 1992, the year before this switch from chloroquine, down to zero by 2001," Plowe says. "We were pretty surprised by that, and that led us to wonder whether now chloroquine might actually work clinically again." Plowe and his team tested chloroquine against its replacement, sulfacoxine-pyrimethamine (SP), in Malawian children with malaria. SP cured only 16 out of 87 children, a cure rate of 21 percent. But chloroquine cured 79 out of 80 children, a cure rate of 99 percent. The experiment showed that chloroquine had regained its potency. Nobody had ever seen that before. Plowe says it doesn't mean that doctors can go ahead and use chloroquine the way they used to. "Right now, I think of Malawi as a little island of chloroquine-sensitive malaria surrounded by a sea of chloroquine resistance," Plowe says. "If we started using chloroquine again there, parasites would become resistant again very quickly, just from migrating in from nearby areas." But the research, published in this week's New England Journal of Medicine does have important implications. First, specialists are now considering a chloroquine-SP combination to prevent malaria in infants and pregnant women. In Malawi, up to half of pregnant women have malaria parasites in their blood. Harvard malaria expert Dyanne Wirth says the resurrection of chloroquine is important if only for this reason. "It's a very significant public-health problem, and there are relatively few alternatives. So in that particular situation, I think this is potentially very good news," Wirth says. Experts are also wondering if they can bring chloroquine back in a bigger way. But this can only happen in countries that have given it a long break, and only in combination with newer malaria drugs. Such a combination would raise the treatment price to $3 per dose, compared to $.10 for chloroquine. Drug treatment will be necessary even if a malaria vaccine passes current tests. Experts expect a vaccine won't be good enough to throw out drug treatment altogether. And when it comes to drug treatment, malaria experts have learned their lesson. Treating malaria with one drug or even two drugs at a time is a losing game.